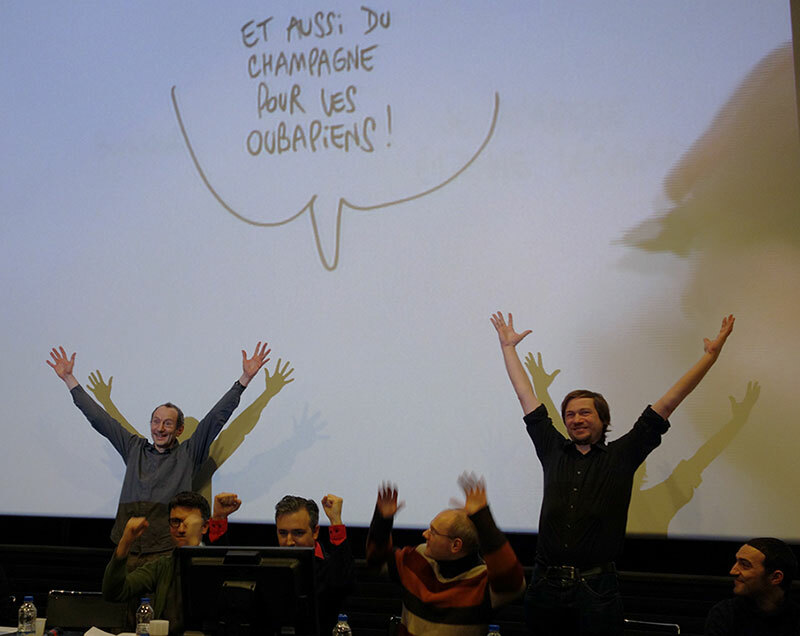 Recently my friends in Oubapo and some invited guests put on the first ever OubapoShow at the Cité Internationale de la Bande Dessinée et de L'Image in Angoulême (oh, and up the hill there was also some kind of comics convention going on?). 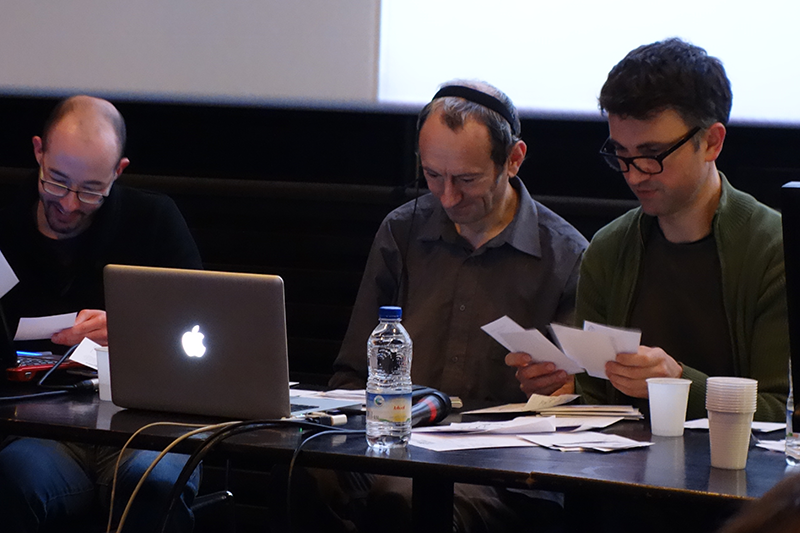 We all did performances, slideshows, and live-drawing events. 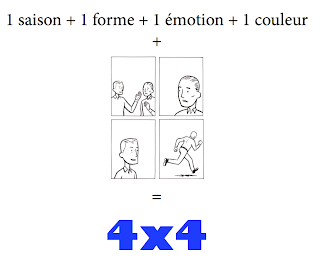 In my case, I came up with Four by Four, a quick but tough constraint for generating four-panel comics. As a way to make it more interactive (and perhaps also to lessen the pressure on me to come up with something excellent all by myself!) I invited the audience to participate as well. After the jump you can learn about the constraint and see all the comics audience members turned in. 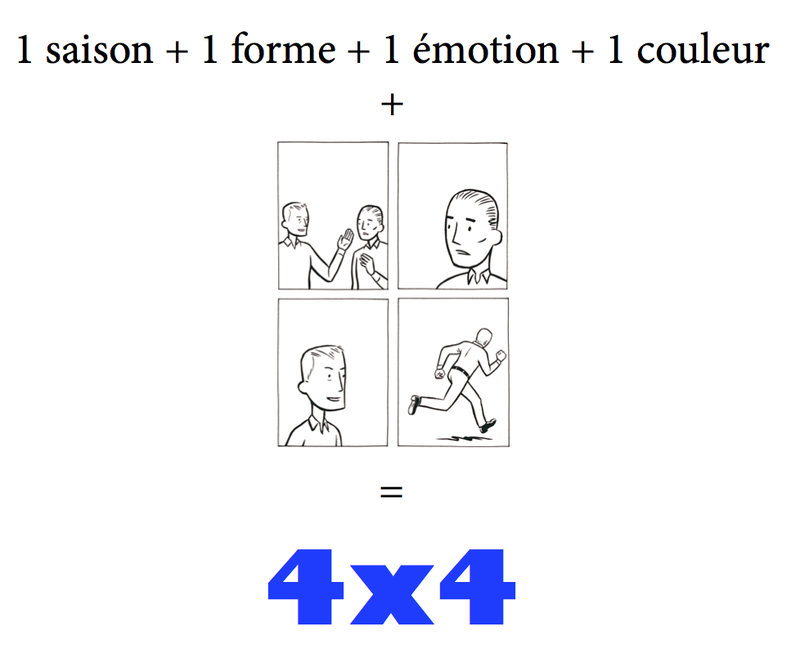 The challenge I proposed was based on sets of four: four panels (which I drew years back for a different project), four sets (seasons, colors, emotions, shapes) of four words each. 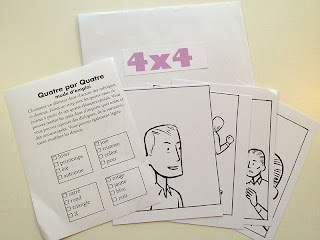 The idea is to choose one word from each of the four sets and make a comic strip using the four panels and the four keywords, adding dialogue, sound effects, narration, etc. You can also alter the drawing to whatever degree necessary. I also handed out about 20 envelopes containing copies of the four panels and a little sheet with instructions and the four categories. While other Oubapians did their presentations I worked at a table on the side of the stage for 20 minutes, writing a strip, showing it to my neighbor Alex Chauvel to revise the French, lettering it, pasting it up, and coming up with a title using all four words. 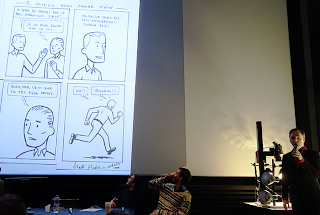 When I was done we collected all the finished strips and brought them onstage. I showed my strip to the crowd using the overhead projector. Not my best work ever but I got some cheap laughs out of the audience (you can make it out in the opening image). While I was doing that, the other Oubapians were quickly sorting through the collected strips to find a few more to put up on the screen. Since there wasn't time to show them all, I offered to put the remaining strips on my blog, so here we are. Merci d'avoir supporté tout ce 'nonsense'. 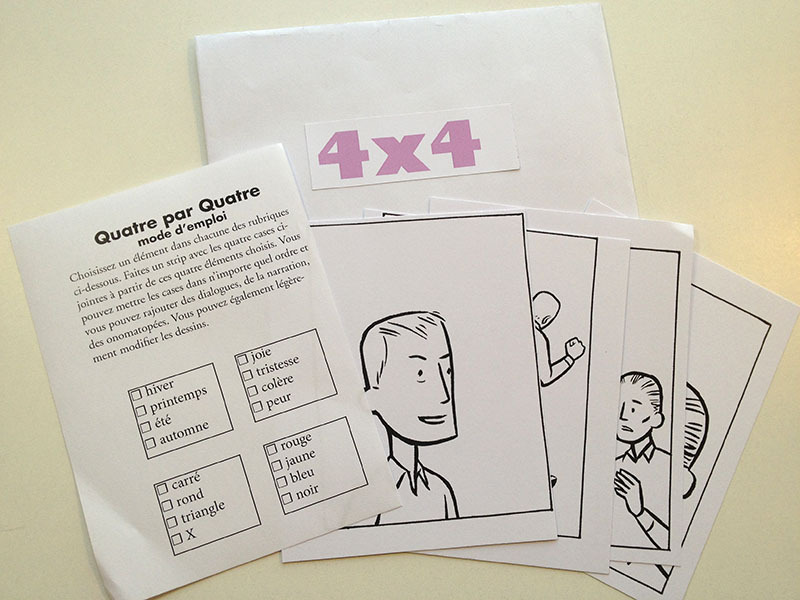 Voici les strips 4x4 faits par la publique de l"OubapoShow. Et Bravo! Cliquez sur le diapo pour l'aggrandir. Et voilà. Merci à tous de la collaboration. Bridge: a "24+7 hour comic"